Young love is a flame; very pretty, often very hot and fierce, but still only light and flickering. The love of the older and disciplined heart is as coals, deep burning, unquenchable. The unthankful heart... discovers no mercies; but let the thankful heart sweep through the day and, as the magnet finds the iron, so it will find, in every hour, some heavenly blessings! It usually takes 100 years to make a law, and then, after it's done its work, it usually takes 100 years to be rid of it. Repentance may begin instantly, but reformation often requires a sphere of years. Books are not made for furniture, but there is nothing else that so beautifully furnishes a house. Our days are a kaleidoscope. Every instant a change takes place in the contents. New harmonies, new contrasts, new combinations of every sort. Nothing ever happens twice alike. The most familiar people stand each moment in some new relation to each other, to their work, to surrounding objects. The most tranquil house, with the most serene inhabitants, living upon the utmost regularity of system, is yet exemplifying infinite diversities. We sleep, but the loom of life never stops, and the pattern which was weaving when the sun went down is weaving when it comes up in the morning. The dog is the god of frolic. Fear secretes acids; but love and trust are sweet juices. Well married a person has wings, poorly married shackles. In this world it is not what we take up, but what we give up, that makes us rich. 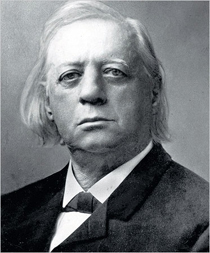 37 quotes by Henry Ward Beecher.